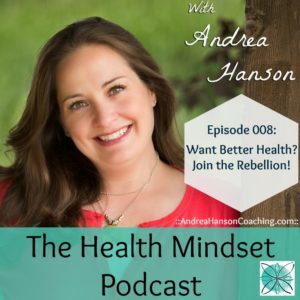 This week on the Health Mindset Podcast, we’re talking about rebelling. Whether you come by it naturally (like me) or are someone who’s just now learning to speak out for themselves, adding a little rebellion can give you that edge on weight loss and health for life. I’ll share what rebelling for your health means (and doesn’t mean) and how to get the most out of it. You’ll learn everything from what white coat syndrome is and how it can devastate your health to how to have the most empowered, freeing feeling ever (and how chocolate lava cake fits into all of it). -Why putting yourself first is essential in order to be there for who and what you most care about. -The four things that must be in place before you can effectively speak out for yourself. -The one, easy thing you can do to be able to consistently do what’s best for your health. -The trap you may be in that prohibits you from knowing what helps you lose weight. At the end of the episode, I give you one simple question to ask yourself to start your own rebellion for your health. This isn’t sit-down-at-your-desk homework, it’s something you can answer without anyone else knowing. This question allows you to start your secret rebellion immediately. Want some good karma? Leave your 5 star review for this podcast (and any other podcasts you love). It is MUCH appreciated. Go to the podcast system of your choice and click “review” and leave a few lines about why you love this podcast! OR leave a comment about this podcast below! Do you want help starting your rebellion? Click here to learn how to get a private coaching session with me.